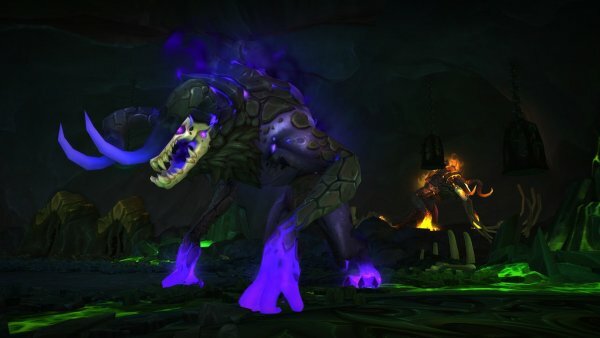 Infused with fire and shadow, F´harg and Shatug are the prized pets of Sargeras. Bred for carnage, these hounds delight in eviscerating their master´s enemies. 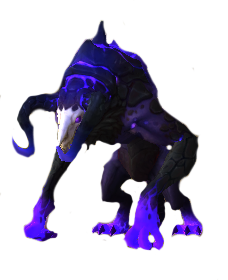 With the Army of the Light and their allies advancing upon Antorus, the Legion prepares to unleash these vicious creatures onto the battlefield and put an end to the mortals´ invasion. In this encounter you will fight 2 fire hound bosses, one that does fire dmg abilities and one that does shadow dmg abilities. The hounds must be tanked 40 yards from each other so they don´t buff each other. The bosses have an energy bar that decides when they will use their abilities (33, 66 and 100 energy) and this energy bar starts and different amount between the hounds on pull. 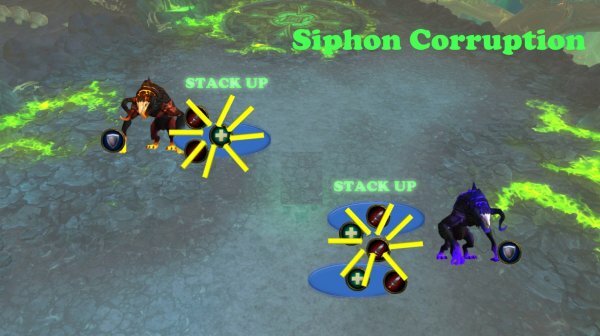 The abilities the bosses do requires the raid to spread or stack. - Boss puts a debuff that will fear for 20 sec and this can be a tank! To prevent this, at least 2 players must stand close to that player. 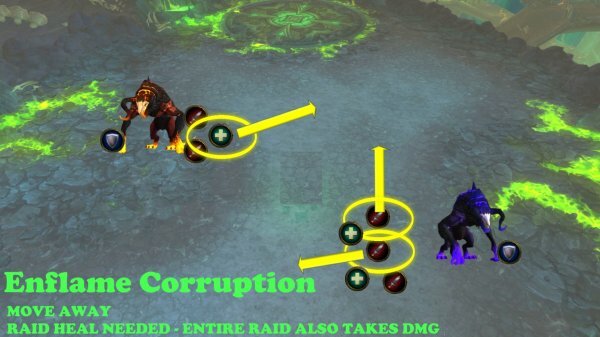 If raid is split in 2 and behind bosses, they can easily move to tank if needed. - Shadow boss shoots an orb on player direction. Having two groups will make the orb miss one group every time. But then the bosses must be tanked diagonally from each other (see image below). 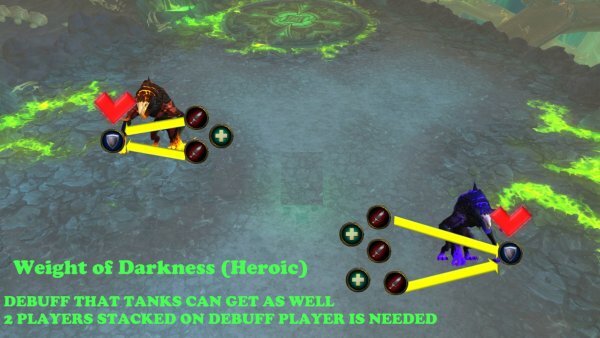 The tanks do not need a tank swap here, the debuff will wear off eventually, just keep in mind to have a bigger defensive cooldown ready when they bite, and smaller cooldowns when you bleed over time, from the bite. Tank them at least 40 yards from each other. Tank them opposite each other with one boss a bit further down than the other. Turn boss away from raid. Behind boss and soft stacks 5 yards. 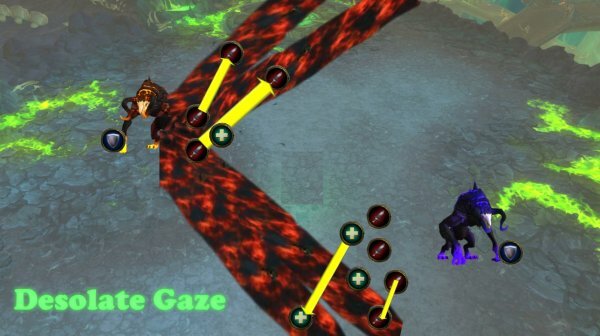 If the two hound bosses are closer than 40 yards from each other, they will increase all damage done by 100 % (Destroyer´s Boon). One tank on each hound and tank each hound on each side of the platform, at least 40y from each other and face them away from raid. The two hound bosses share health (Soul Link). Both hound bosses have an energy bar that ticks up. The timers when they do their abilities are based on the amount of energy. When reaching 100 energy and after they do their 100 energy ability, the bar starts over from 0 again and ticks up again. Note: It seems random on what energy they start on and the two hounds starts at different energy. The time when this boss does his abilities is based on the energy the boss has. 66 energy (Normal) – Probably The Gaze again. 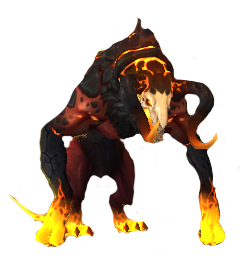 Boss bites the tank that does very high fire damage and leaves a debuff called Smouldering. This debuff does low fire damage every 1.5 sec for 12 sec to anyone in front of the boss in a 25 yard cone. Face boss away from raid. Use a major defensive on each Burning Maw and keep some minor def up during the 12 seconds. No tank swap, debuff will wear off from time to time. A line is created on the ground between targeted players and the boss. This fire line follows the players direction movement. After 8 seconds, a flame charges through that line and does very high fire damage to anyone in that line and a knock back. In general: Each raid group soft stacks 5 yards for each other behind their hound boss. Targeted players run to the sides away from raid and spread from other targeted players. Wait until hit, then run back to position. Note: This targets melee and ranged players (not tank). Boss targets several players and stuns them. While stunned they will be lifted up in the air and do ticking and stacking dmg on the targeted player for 9 sec. While in the air, targeted players will also spit out fire balls on the ground near them that does medium fire damage if hit. Targeted players are immune to this damage, it only does dmg to other players. Move away from targeted players at least 5 yards. Random players get a debuff that lasts for 9 sec. The debuff is called Enflamed and does pulsating fire damage to the player and players within 8 yards. All players take low fire damage every 1.5 sec when players have this 9 sec debuff. In general: Each raid group soft stacks 5 yards from each other behind their hound boss. Run/Spread away from each other at least 8 yards. A circle on the ground shows the dmg area. Beware of the raid dmg over 9 sec. Always check the energy bar based on your healing ability timers to make sure you have major healing cooldowns ready when boss has 100 energy. 66 energy (Normal) – Probably The Sphere again. Boss bites the tank that does very high fire damage and leaves a stacking debuff called Decay. This debuff does low/moderate shadow damage every 3 sec for 12 sec to anyone in front of the boss in a 25 yard cone. Boss shoots out a shadow orb that travels toward a player direction. This orbs pulls in players that are close to it. Getting hit does low/moderate damage every second. In this way, the orb will only travel and pass one group, ranged or melee. Only ranged player on this hound boss. Stand a bit further back behind boss. 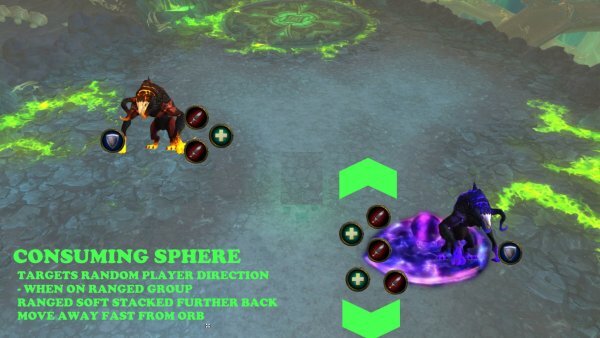 If the orb targets ranged: Run to the sides to dodge the orb. If the orb targets melee: down than the other. Melee moves away from orb. Boss puts a debuff on random players. This debuff progressively slows the player for 5 seconds. After 5 sec, the player is feared for 20 seconds. Players within 8 yards of debuffed player will share the fear timer evenly between them. 3 players within 8 yards of debuffed player will remove the fear. When debuff comes, make sure targeted player has 2 more players on them to remove the fear. Tank can get the debuff, if so, ranged group helps tanks on shadow boss and melee helps tanks on fire boss. Random players get a debuff called Siphoned and lasts for 9 sec. This does very high pulsating shadow dmg every 4 sec. The dmg is divided evenly between players that are within 8 yards. All players take low shadow damage every 1.5 sec when players have this 9 sec debuff . 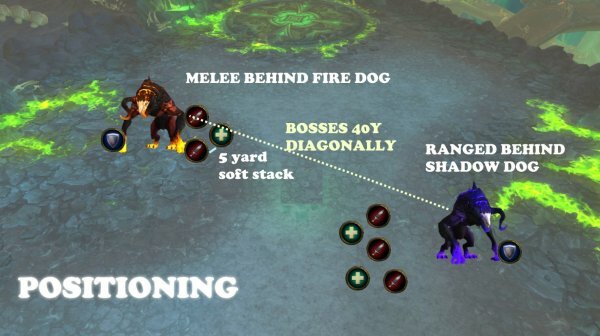 When debuff comes, make sure melee stacks on melee debuff player and ranged stacks on ranged debuff player.